What's for breakfast in Mexico? It's the most important meal of the day and you want to be sure to eat enough to tide you over for a full day of sightseeing or adventure. Since in Mexico the main meal of the day is taken around 3 or 4 pm, it's a good idea to take advantage and have a hearty breakfast to get you through until then. In Mexico breakfast is called "desayuno," but this usually refers to a light meal that you eat shortly after waking up, whereas a heartier meal served mid-morning (or until around 1 pm) is usually called "almuerzo", basically what we would call brunch in English. Breakfast dishes, like other foods in Mexico, vary a great deal regionally, but eggs and corn dishes feature prominently on breakfast menus, though meat and vegetable dishes may also be eaten at breakfast-time. 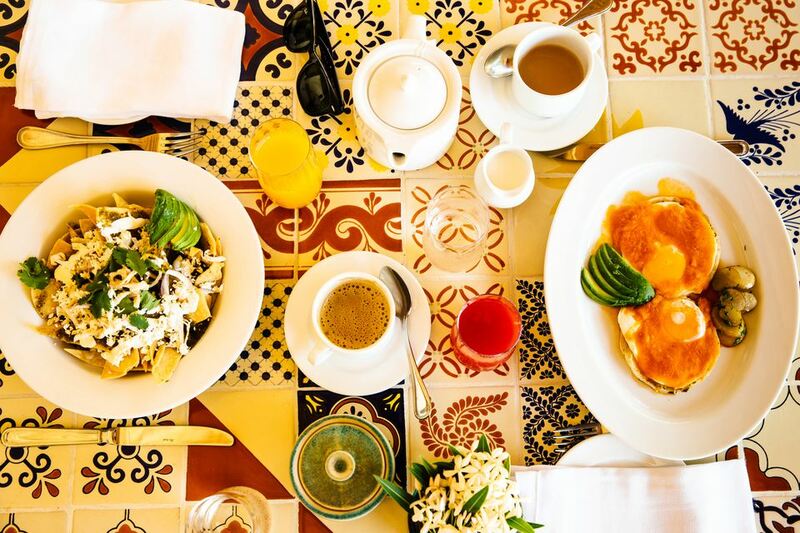 A full Mexican breakfast may be comprised of a few different courses. You will usually start with "pan dulce" (sweet bread), and a hot drink. Coffee or hot chocolate are standard, or you can try atole, a drink that's thickened with corn masa, rice (atole de arroz), or alternatively oats (atole de avena). Atole with chocolate mixed in is called champurrado. You may also be offered fresh fruit or freshly squeezed juice before the main breakfast course. Since there's such a profusion of delicious fresh tropical fruit in Mexico, it's a good opportunity to try these fruits at their best. Pineapple, papaya, cantaloupe, bananas and watermelon are popular, but you can also try other regional fruits like mango and guava when they're in season. There are many delicious street food options for breakfast. Across various regions of Mexico, thick, round tortillas are topped with beans, cheese and other ingredients and referred to as memelas, sopes or picaditas. Huaraches are also very similar, though usually larger and more oblong so that the shape resembles a huarache (sandal). Other similar street food options that are good for breakfast the tortilla is made into a pocket and stuffed with different fillings, such as gorditas and tlacoyos. Budget travelers should take note that breakfast is generally the cheapest meal of the day so eating a big meal early in the day and smaller meals later will help you save some pesos. You can find great breakfasts for low prices at "cocinas economicas" or "fondas" - small family-owned restaurants, or in market stalls, but the coffee is often less than stellar. If starting your day with good coffee is important to you, buy a cup of coffee at a coffee shop and take it with you. Huevos Rancheros are fried eggs served on top of a lightly fried tortilla and smothered in a sometimes spicy tomato sauce. This is possibly the most famous Mexican breakfast dish north of the border, but it's not as popular in Mexico as you might expect. You will still find them, though, along with a wide variety of other egg dishes. Chilaquiles are a hugely popular Mexican breakfast dish. These fried corn tortillas are smothered in sauce and sprinkled with cheese and a dollop of cream and topped with some finely sliced onion and parsley. When chilaquiles are done just right they are neither too soggy nor too crispy, but the perfect intermediary point. Basic choices are chilaquiles verdes or rojos (green or red), but you may also find other sauces. They're often served with refried beans and a choice of eggs or meat. Mexican-style eggs, "Huevos a la Mexicana" are scrambled eggs cooked with onion, tomato and chile pepper - most often jalapeño, but sometimes serrano chile, which tends to be spicier. The name comes from the fact that the added veggies give the dish the colors of the Mexican flag. If you don't want it too spicy you can specify "con poco chile" (with just a little chile), but if you do like it spicy, you may want to specify that too: "con bastante chile," as there may be an assumption that foreigners prefer milder foods. The Swiss would probably not recognize this dish, but "Swiss enchiladas" are a popular dish in Mexico, for breakfast or any time of day. Lightly fried tortillas stuffed with chicken and covered in a green tomatillo sauce that usually also has cream in it, and covered with cheese. The Swiss get the credit because of the cream and cheese additions, though the dish is said to have originated at Sanborn's restaurant in Mexico City. Besides enchiladas suizas, there are many other types of enchiladas. These vary quite a lot regionally. Sometimes stuffed with chicken or cheese, sometimes the tortilla is just drenched in a sauce. Tacos make a great meal any time of day. You may choose to fill your tacos with meat, but for the morning meal, there is a wide range of fillings available. Options often include a selection of guisados (prepared dishes or stews often with eggs, chorizo, potatoes, other meats and vegetables) presented DIY-style in clay pots that are called cazuelas. Plop your favorite in a tortilla with a bit of cheese and salsa, maybe a little guacamole, and you have a perfect breakfast option. Tamales are another traditional Mexican food that can be eaten for breakfast or any other time of day. These are made of corn masa dough with different fillings. They're most often wrapped in corn husk but sometimes in banana leaves. The guajalota or torta de tamal is popular among workers in Mexico City for a quick breakfast on the go. This is basically a tamal (sometimes deep fried!) stuffed inside a bolillo roll making a tamal sandwich (carbs and more carbs!). You'll find street vendors selling them in the mornings on street corners. Choose whatever fillings you like: meat, veggies, cheese and enjoy it all wrapped up in an egg envelope. Great way to start the day!